"In 1915, after the SPD supported German involvement in World War I, she and Karl Liebknecht co-founded the anti-war Spartakusbund (""Spartacus League""), which eventually became the Communist Party of Germany (KPD). 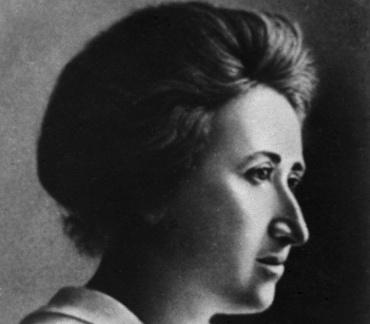 During the November Revolution she co-founded the newspaper Die Rote Fahne (""The Red Flag""), the central organ of the Spartacist movement. With the crushing of the Spartacist uprising of January 1919 by Friedrich Ebert's Majority Social Democratic government who sent in the Freikorps to crush the Spartakusbund, Freikorps troops captured Luxemburg, Liebknecht and some of their supporters. 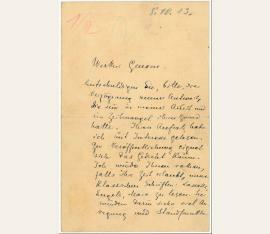 Luxemburg was shot and her body thrown in the Landwehr Canal in Berlin." Sozialistin (1870-1919). Autograph postcard signed ("Rosa L."). [Berlin]. ½ S. Qu.-8vo. 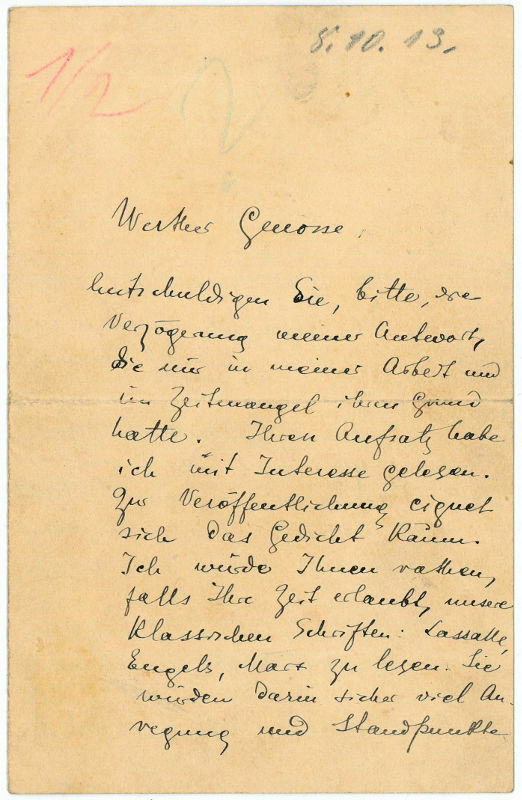 Postscript on an autograph postcard by the socialist Luise Kautsky (1864-1944). Both ladies extend their condolences to the widow of the social democratic politician Ignaz Auer, who had just passed away at the age of 61. "I cordially shake your hand at this sorrowful hour. You know how deeply I admired your husband; I am quite unable to adjust to the thought that we shall no more see this splendid figure amoung ourselves, and it is with pain that I remember those few moments when I beheld his unforgettable face with that wonderful expression in his eyes. I feel that we have been suddenly impoverished and that it has become cold all around us [...]" (transl.). 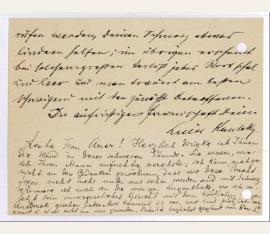 - On stationery with letterhead of the "Neue Zeit"; holes punched in left margin (slightly touching text)..
militante socialiste et théoricienne marxiste (1870-1919). Autograph letter signed. Sans lieu. 1 p. sur 1 f., in-4, plié en 2, au verso, adresse impr. de l'hôtel Polen à Amsterdam. Perforations marginales. 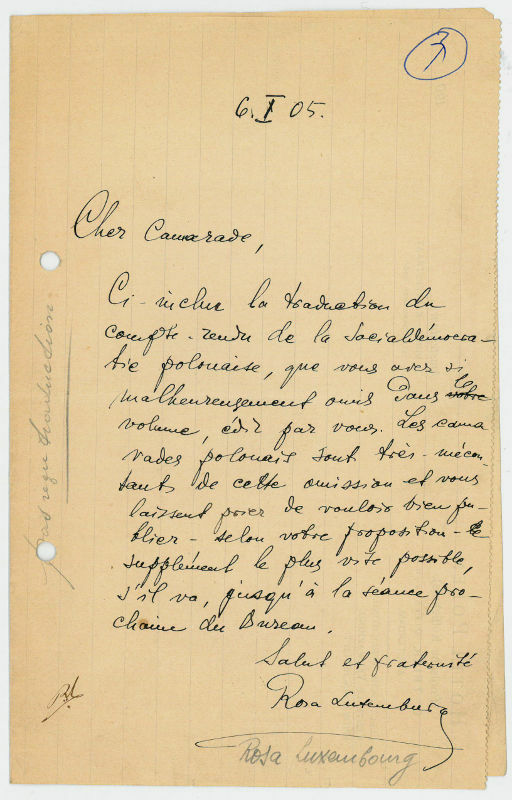 To one "cher Camarade", probably written after the International Socialist Congress, sending the translation "du compte-rendu de la socialdémocratie polonaise, que vous avez si malheureusement omis dans le volume, édité par vous. Les camarades polonais sont très mécontents de cette omission [...]". - Left margin with punched holes (not touching text); on stationery with printed letterhead of "Hotel Polen" at Amsterdam. Marxist theorist and activist (1870-1919). 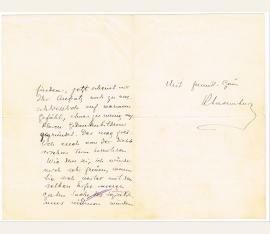 Autograph letter signed ("RLuxemburg"). No place. 8vo. 2½ pp. on bifolium. Letter to a comrade who had contacted her with publishing questions, in part (translated): "This poem is hardly suitable for publication. I would advise - if your time allows for it - to read our classic writings: Lassalle, Engels and Marx; you would certainly find many ideas and viewpoints. Right now, your essay to me seems to be based on solely warm feelings instead of clear concepts. That may also derive from the poetic form (of the essay). Having said that, I would be very pleased if you continued to dedicate yourself with the same enthusiasm to our good cause of socialism […]". 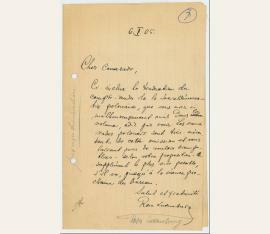 - In fine condition, with a fragile central mailing fold, mild soiling, and a few pencil notations. 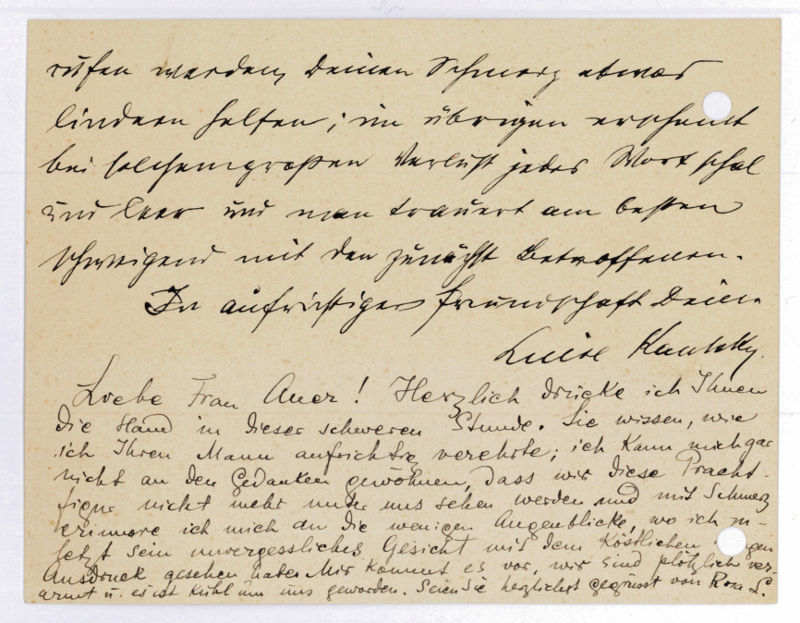 Accompanied by three unsigned postcard photos..
Letter to a comrade who contacted her with publishing questions, in part (translated): “This poem is hardly suitable for publishing. I would advise—if your time allows for it—to read our classic writings: Lassalle, Engels and Marx, you would certainly find many ideas and viewpoints. Right now, your essay to me seems to be based on solely warm feelings instead of clear concepts. That may also derive from the poetic form (of the essay). Having said that, I would be very pleased if you continued to dedicate yourself with the same enthusiasm to our good cause of socialism.” In fine condition, with a fragile central mailing fold, mild soiling, and a few pencil notations. Accompanied by three unsigned postcard photos.